One of the great mysteries of Hamiltons is when the first B models showed up. Maybe it's not such a great mystery after all, as the first B model to show up also showed up with a C model - and that's the Secometer B and Secometer C, from 1948. But they were cataloged as such and didn't actually look like the original Secometer, so that shouldn't really count. I suppose in order to me more clear I should have said when did the first non-cataloged B models that looked exactly like non-B models show up? Other than the Secometer B, Hamilton started to use the B nomenclature for when an existing model had a movement change that required a different case. There were three short periods when that sort of thing occurred. The first was in 1952 when the 12/0 750, 753 and 745 replaced the 14/0 980, 982 and 982M movements. There are lots of B models from this period since a lot of models that were produced with 14/0 movements continued to be produced for a couple of more years with the new 12/0 grades. From the outside you would never be able to tell what was different. But the case back and the dial had to be different to accommodate the different movement. Hamilton didn't emphasize the difference in movements either... they just marketed the models as having 17 or 19 jewels. The second period where B models were common was in 1955 when the 12/0 22 jewel 770 movement was introduced. Oddly, since the 770 is the same physical size as the other 12/0 sized grades, no case change was needed and a B model wasn't justified. However, the 770 also replaced the 8/0 747 movement in certain solid gold models... and those did require a different case so they became B models... for example, the Parker and Parker B. The third period of B models occurred shortly thereafter when the Hamilton Illinois models were phased out in 1956. A lot of the entry-level Hamiltons used excess Illinois branded movements so they were B models until the Hamilton branded movement replaced them. Anyway, as you might suspect, I have B model to show you. It's a Gordon-B. The Gordon was introduced in 1941 and produced through 1953. I'm going to assume the Gordon-B started in 1952, when the 754 replaced the 982M. The Gordon is one of Hamilton's highest-end models. Only the platinum Cambridge or Rutledge were more expensive. 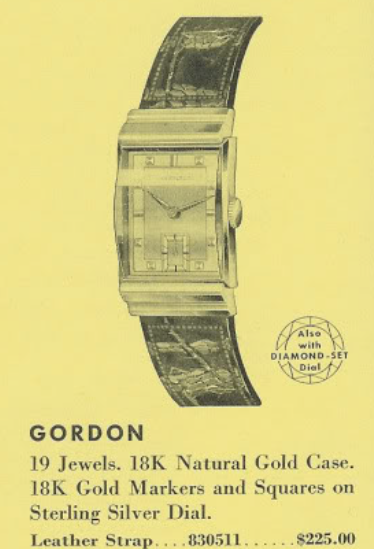 The Gordon came in a solid 18K gold case and in some years it was also offered in both white or yellow gold. You also had a choice of a two tone butler-finished dial with solid 18K gold markers or with diamonds. Being such a premier model, you should only see a "medallion" movement inside like the 982M for the Gordon or the 754 for the Gordon B.
I recently landed a Gordon B and I was lucky to get it... probably because it looked terrible and scared off a lot of people. If you look closely though, you can see the case is very crisp and that's what is most important. Everything else can be replaced but the case cannot. This watch was a presentation for 30 years service in 1955. Although the company is Humble, this watch is anything but Humble. Today if you were lucky to work for the same company for 30 years they would probably give you a fishing pole or kitchen knife set. This dial looks terrible and I have serious doubts that it can be cleaned to look even remotely presentable. It can be refinished to look like new though - so that's the route I'll take. The dial curves a bit so this watch uses a spacer plate under the dial and a longer cannon pinion and hour wheel. Like the 14/0 movements, the 12/0 grades have two different length cannon pinions, depending on what the model called for. The movement is dirty but it doesn't look anywhere near as bad as the dial would have led you to believe. I don't often see 18K stamped inside a case back. I'm more of a gold filled or RGP-kind of guy. I love solid gold cases though. They are easy to spot because they never show verdigris, or the green corrosion typically found on gold filled cases. This watch definitely calls for a new glass crystal. The movement is ticking away with good motion... I suspect the timer will confirm that everything is working as it should. Yup - no complaints here. I'll leave it like this for a while and check it after it has a chance to settle in. I actually started this project about a month ago so it took me a while to get my dial back from the refinishers. With a new crystal and a fresh lizard strap, this Gordon-B is a remarkable transformation. The case is very crisp. I don't know what happened to sour the dial the way it was but whatever it was, at least it didn't harm the case. This not-so-humble watch is ready for another 60 years of service. Fantastic work on that timepiece..and on the dial especially. Some transformation. Seems like the refinished dial has changed shading, whereas the original was shaded on the outsides of the face and second face, where the refinished is in reverse. Was that deliberate, tho not original ? Just perusing vintage Hamiltons as I have my grandfathers 'Boulton' who's dial has seen better days..tho considering if I should have it restored.